Where do I find safety clothing? When you need clothes for work that will give you the most protection a garment can provide, look no further because you came to the right place. 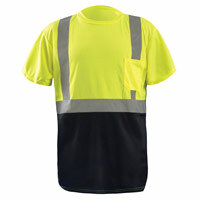 Safety Smart Gear has a huge selection of high visibility safety clothing, a large catalog of flame resistant apparel and top brands of personal protective equipment. 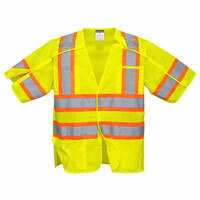 Most job safety clothing requirements are based on safety standards. You can shop for apparel on this site by considering the ANSI standard required by your workplace to meet or exceed compliance of these standards. Environments which pose stuck-by hazards from moving vehicles, equipment and machinery, but will not include expose to traffic on public access highway rights-of-way or roadway temporary traffic control (TTC) zones. Environments which include exposure to traffic from public access highway rights-of-way, or roadway TTC zones, or from work vehicles and construction equipment within a roadway TTC zone or from equipment and vehicles within the activity area. Provides additional options for emergency responders, incident responders and law enforcement who have competing hazards or require access to special equipment.